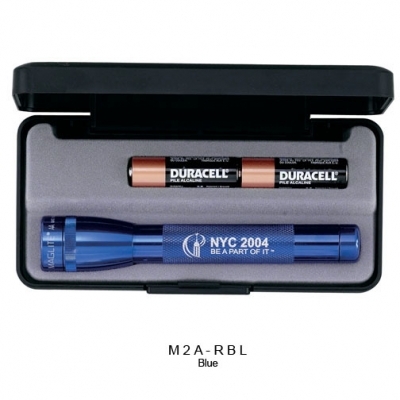 The Mini Mag-Lite M2A shines up to 70 times brighter than flashlights with comparable battery resources. Your Corporate Logo would look great on a Mag-Lite. THE WORLD FAMOUS AA MINI MAG-LITE® 5 3/4" in length. Comes with 2 "AA" batteries. The flashlight that changed an industry. Never before has such a powerful beam come from such a small flashlight.It shines up to 70 times brighter than flashlights with comparable battery resources.The 5 3/4" "AA" Mini Mag-Lite® fast focus beam adjusts from spot to flood with the turn of the head. • Converts quickly to a free standing candle mode and is water & shock resistant. Comes with a spare bulb in the tail cap. • Cited by Fortune and Money Magazine as one of America's best-made products. • The perfect Promotional Item. Colors: Shown above in color menu. Laser Engraving - appears white. Engraving one location (head or barrel) included in price. Packaging: Sleek, black presentation box. Optional 2nd Location Engraving $.90 (g) plus set-up charge. See our instructional video page, "How The M2A Mag-Lite® Lights Up The Night"